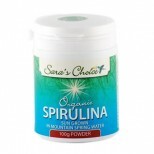 Certified Organic Sun Grown Spirulina - Nature's Multivitamin - The Finest available today. This tiny aquatic plant has been eaten by humans since prehistoric times, it was known by ancient tribes in Africa as Dihe, the Aztecs called it Tecuitlatl. In recent decades it has been known by the health conscious as ‘Green Gold’ - because there is no other single food on earth to equal its nutritional profile.